JENISON, Mich. – Officials in Ottawa County, Mich. will be restoring a sign citing Scripture to a public park—but with a disclaimer—after it was removed following a complaint from a local resident. 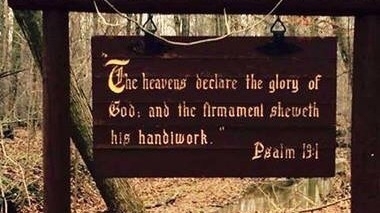 As previously reported, the sign at issue quotes from Psalm 19:1, which reads, “The heavens declare the glory of God; and the firmament sheweth his handywork.” It was erected at Hager Park in Jenison in the late 60’s or early 70’s by the county road commission. It has remained at the site for at least 40 years. But last year, an unidentified resident complained to officials about the sign, asserting that it was wrongful to promote Christianity with public resources. John Scholtz, Ottawa County Parks and Recreation director, told MLive that after consulting with the board about the matter, he had the sign removed. He said that current park policy prohibits signs that do not serve informational purposes. But a number of Christians urged the Ottowa County Board of Commissioners to the restore the sign to its place, and a petition was launched over the matter. In late January, the board voted 9-2 to reinstall the sign, but also said that text regarding the history of its placement would be added. According to reports, the sign was part of an agreement that the county made with resident Titus Hager when he deed the land to them. Now, park officials are unveiling the design for an informational sign that will be erected next to the original Scriptural display. The sign includes a photograph of Hager, after whom the park was named, a history of the adjacent sign, and a disclaimer stating that Hager’s views are not necessarily those of county officials. But there was recently disagreement about some of the proposed wording for the sign, which stated that the Bible display was removed following a “request by citizens.” Some stated that the phrase “by citizens” implied that there were a number of complaints when there was only one request, and so the Commissioners thus suggested that the two words be removed. The Wisconsin-based Freedom from Religion Foundation (FFRF) sent a letter last month to the Commission, requesting that it reverse its decision to restore the sign, but the board has said that it is unlikely that it will change their minds.